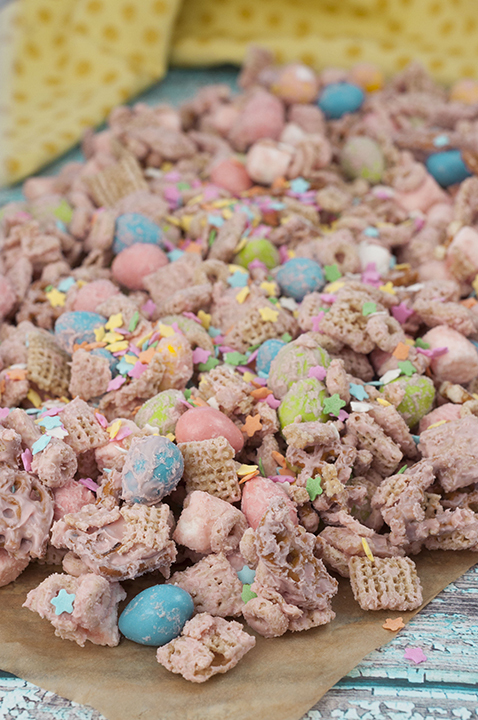 Easter Bunny Tail Chex Mix recipe loaded with peanut M&M’s and chex is the cutest holiday Easter treat and so quick and easy that kids can help make it! Nothing is more fun for a holiday than a festive version of “white trash” am I right? You have all shown so much love for my Valentine’s day version (Cupid Crunch). My St. Patrick’s Day version (Leprechaun Bait) also really held it’s own in March. The love was so great and so real that I decided a few weeks ago to make an Easter version! Let’s call it Easter Bunny Tail Chex Mix. What does the “bunny tail” mean, you ask? I added mini marshmallows for kind of a fun little twist. The mini marshmallows are, you guessed it, representing the little bunny tails! How cute is that? Come on, anything with the word “bunny” in it is automatically adorable. 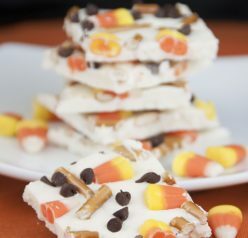 You can make this for your kiddos to bring to school, serve it at a party, or keep it all to yourself! Speaking of adorable, I decided to “move” my office to the kitchen table this morning for the first time in a long time. I mostly do all of my work at my desktop or my laptop while sitting on the couch. So the adorable part is that I was sitting in my “summer spot” at the kitchen table where I do my bird watching in the spring and summer, much to Mr. Wishes’ dismay. You know, when I used to sit there and stalk the two nests of eggs I had right outside in my backyard last summer. I’m looking out today and saw a huge family of bluebirds! All of my bluebirds that come year after year and build a nest in my front yard mailbox have already arrived for the season. Hooray! I’m talking there was blue EVERYWHERE in my yard today. It couldn’t have made me any happier. Spring is coming! 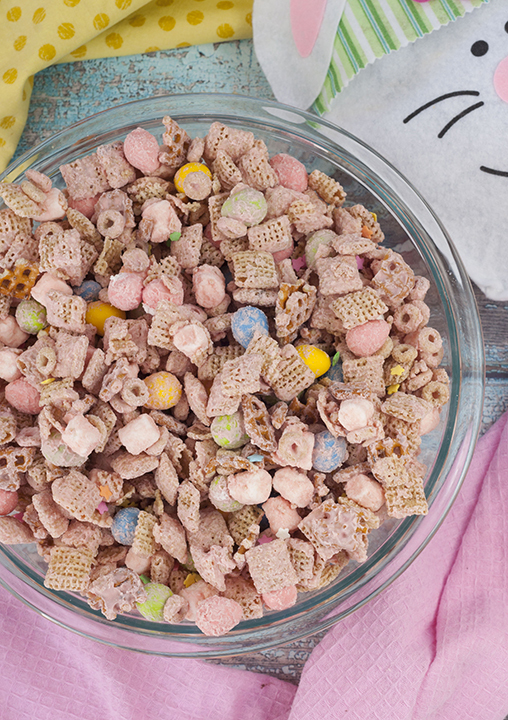 This Easter Bunny Tail Chex Mix can be for Easter but is really an all-around spring recipe and can be easily adapted for any occasion. Baby shower? Make this. Spring party? Make this. 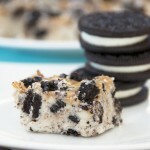 Just….make this. You can also feel free to peruse all of my Easter recipes for more fun ideas. I also made this Salted Caramel Easter Popcorn recipe and this Easter Bunny Bark that are both family favorites. Enjoy! 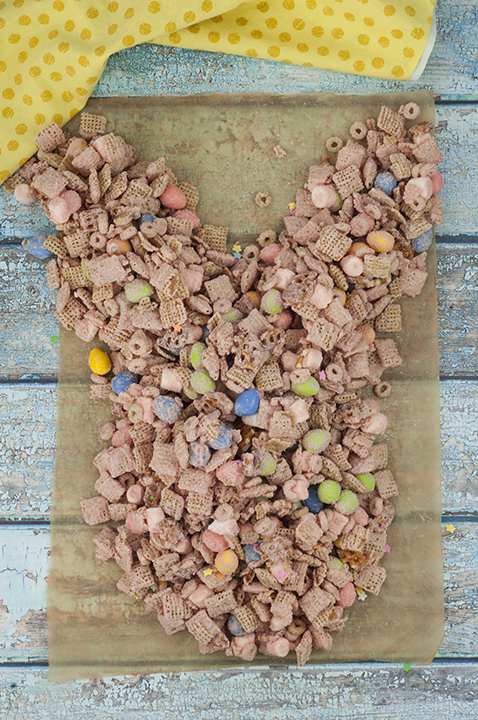 Easter Bunny Tail Chex Mix is the cutest Easter treat and so quick and easy that kids can help make it! In a large bowl combine Rice Chex, Cheerios, crushed pretzels, marshmallows and candy. In a heat-safe bowl, melt the chocolate chips in the microwave for 30 seconds on 50% power according to directions on package. Stir and repeat until the chips are completely melted. Stir carefully to combine, as to not crush the Rice Chex. Stir until the mixture is completely coated with the white chocolate. Pour mixture onto wax paper or parchment paper to dry and spread it out. 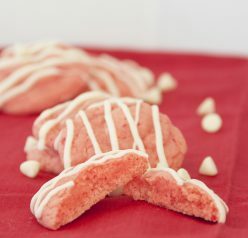 Allow to set/cool until white chocolate has hardened (about 30 minutes) and then break up into pieces. Store in an air-tight container or devour right away! Yay for those returning bluebirds and yay for this Eater trail mix! This is super fun! I have a feeling that only the marshmallows would get eaten at our house… ha! Love the holidays for fun things/eats like this. : ) You’ve got the right spirit and I know this mix is irresistible! Cute! And pretty. Love Chex Mix — and love how creative this is. Fun twist on an old favorite — thanks!